At Captain Towing we know that situations calling for car towing may arise unexpectedly anytime during the day or night. Since we have charged ourselves with providing the motoring community of Dallas with comprehensive solutions to all towing and roadside assistance needs we operate nonstop and offer all our services, car towing included, 24hr a day each and every single day of the year. Captain Towing is a local, Dallas based, towing company. We have been providing the local community with all kinds of towing and roadside assistance services for over a decade now, the reputation we have earned during this time is testament to our success at meeting our full customer satisfaction goal. At Captain Towing we always follow through with what we promise. This includes a 30 min ETA to any location in or around Dallas, our 24hr a day availability and our hard to beat rates. Our 24hr car towing service is top class and extremely attractively priced. At Captain towing we know how anxious you probably are to get the situation calling for a tow sorted out. We operate a large fleet of tow trucks of all kinds so that we always have one available for immediate response, no matter what time it is, weekends and holidays included. It is this, along with super efficient logistics (a continuously manned dispatch for instance) which ensure we neber fail to meet the 30 min ETA we promise. 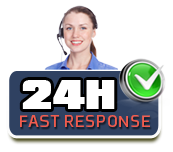 Just like all with all that we do our 24hr car towing service is extremely professional. We only hire tow techs who are top of their field and we make sure to provide them with state of the art, fully equipped tow trucks. This combination of highly professional techs and top class gear means from us you will receive nothing but the very best kind of service. At Captain Towing Dallas we believe that in order to achieve full customer satisfaction, offering attractive rates must complete the fast, professional service we provide. Our unequalled efficiency and honest billing policy ensure our rates are among the lowest to be found.